Raspberry Pi’s are such versatile devices, therefore when deciding a case to house your project there are hundreds to choose from. There is nothing better then customizing, your project with a neat Raspberry Pi case to house that project. Here are some of my top picks for Raspberry Pi cases that can be found on Amazon. These are Raspberry Pi cases which really focus on bringing together the pi and touch-screens into a neat package. The SmartiPi touch is a case designed for the official Raspberry Pi Touchscreen. There are several reasons why this case is a top pick. It supports several versions of Raspberry Pi’s: A+, B+, 2, 3B, and the 3B+. The has an adjustable viewing angle for the screen. The body of the case is made of a durable sturdy plastic. The base of the case looks sturdy and also has some mounting holes. Lego Block on back of SmartiPi. This case has some neat well thought features. For example there is a piece on the back of the case which allows a user to put Lego pieces on it. This allows you to customize the case using Lego to fit the needs of your project. In the product description it appears many users, used the Lego block section to attach a camera. I am sure however, you could use it limited to what your imagination could come up with. Raspberry Pi Camera on a Lego section of the Smarti Pi touch Case. Here is a video from TheLomaxProject, here he shows how to setup the SmartiPi Touch. As you can see the construction of this case puts it at a top pick for as a case, especially with it supporting the official touch screen. The GeekWorm is a the perfect case if you are looking to simply package your Raspberry Pi and a a screen in a durable, yet customizable case. The Geekworm has a fairly small footprint as a pi case. It support 5 inch HDMI TFT LCD screen. The case is also compatible with any Raspberry Pi model 2 and 3. What makes this case a top pick, is that it is on the lower end regarding a price point. It offers a small, but clean footprint for any project. With the case being acrylic you could also laser cut or CNC mill a logo on the case. This case could also be easily modified to fit any project needs. These Raspberry Pi cases are focused in bringing back the nostalgia of retro gaming, and for adding that flair to the pi. If you are a fan of the GameBoy like I am, you might like a case that makes your Raspberry Pi look an original GameBoy, but also lets you utilize all the features of a pi. The GameBerry Retro Case supports the Raspberry Pi 3 and 2. This case is designed using durable hard plastics, acrylic, and stainless steel screws. If you buy the case from Amazon you will also receive a free heat-sink for your pi. Using a heat-sink with RetroPie is highly recommended, that way you can over-clock the pi. The GameBerry Retro Case is a great Raspberry Pi case, not just for making a RetroPie but for many other Raspberry Pi projects. The design of the case makes it easy to still access the GPIO pins, USB ports, HDMI port, and Ethernet port. The guys from Retroflag have a series lineup of retro gaming cases, and accessories for the Raspberry pi. They feature a case that will turn your Pi into a Sega Gensis. This case even features the 16 bit description on the top of the case. This case is designed for Pi 2’s and 3’s. It also has physical power and reset buttons within the case. A ventilation fan to help with cooling on your over-clocked pi. There are also two usb ports on the front of the case. Which are labeled Control 1, and Control 2. The case features a door which allows easy access to your pi, and SD card. Retroflag also has a case for turning your Raspberry Pi into a SNES. This case also features a safe shutdown and safe reset physical buttons on the case. There is also a case fan for cooling your over-clocked raspberry pi. There is a storage compartment for all your microSDs. This Raspberry Pi case also features controller one, and controller two USB ports on the front of the case. This case would bring anyone back to the good old days of sitting and playing their SNES on a Saturday morning. These are generic multi purpose Raspberry Pi cases for help in aiding to any type of project for your pi. These cases offer durability, sleek design, and bring an added flair to your pi project. iTrunk has provided a starter kit for the Raspberry pi which is perfect fit for projects where you want utlize the processing power of the raspberry pi. A perfect use for this case would be for housing your Raspberry Pi as a Pi-hole Server. This starter kit features the sleek designed pi case, which is held together with some stainless steel screws. The case allows access to all peripherals like the USB, HDMI, and Ethernet ports. From what I can tell there isn’t access to the GPIO pins. Which is why I would recommend this case as a perfect case for server, and processing projects. The starter kit also includes 3 heat sinks for your Raspberry Pi. There is also a good amount of air flow provided by small vents within the case, to cool those heat sinks. The kit also includes a 5V 2.5Amp power supply for the Raspberry Pi. The Wingoneer Protector Raspberry Pi case is another very functional yet minimalist design perfect for any project. Features laser cut acrylic with laser cut wood to layer together the sections which slot around the pi. This case also comes with a Cooling fan which fits perfectly in the fan cutout on the top of the Raspberry Pi. Similar to case the case that I have on my Raspberry Pi Zero found here. Being minimalistic yet with features great protection for the raspberry pi. It also allows access to any interface on the pi. If you are looking for my multi purpose top pick case, this is it! This case is an easy to assemble durable hard plastic case perfect for any Raspberry pi project. It comes as two pieces that simply snap together around the pi. There are four easy wall mountable holes on the bottom. On the underside are some ventilation holes to help keep the pi cool. All ports and GPIO pins are accessible. There are slots to access the Display and Camera ribbon cable pins. HDMI, Audio out, USBs, GPIO pins, and Ethernet port all are assessable via perfectly cut out slots. What makes this case a top pick for me in the multi purpose cases is with a low price point, easy assembly, and access to all ports and interfaces on the pi. This case is the perfect case for any general raspberry pi project. It wouldn’t matter the project type, this case would fit the bill. These are cases that I think are awesome, and would love to try them out. Who hasn’t wanted to make a Raspberry Pi cluster? This case helps you accomplish that by layering together the pi’s into an organized stack. You can buy this case in a set of four or as a single. This means you could stack together many configurations. The Flirc Gen2 case turns your Raspberry Pi 3 or 2, into a sleek, neatly durable designed mini PC. It reminds of the Intel Nuc, or some other mini PCs. Just a nice simple design, made out of durable aluminum. This is a case which would be perfect for a HTPC setup. You could put this by the television, and not have to worry about aesthetics. The Raspberry Pi Armor Metal Case by Professional Angle would be the perfect case for any robotics project using the pi. This durable aluminum alloy case would be perfect for putting your pi to work. I would love to use this on a robotics or drone project. This case can be configured for dual fans. 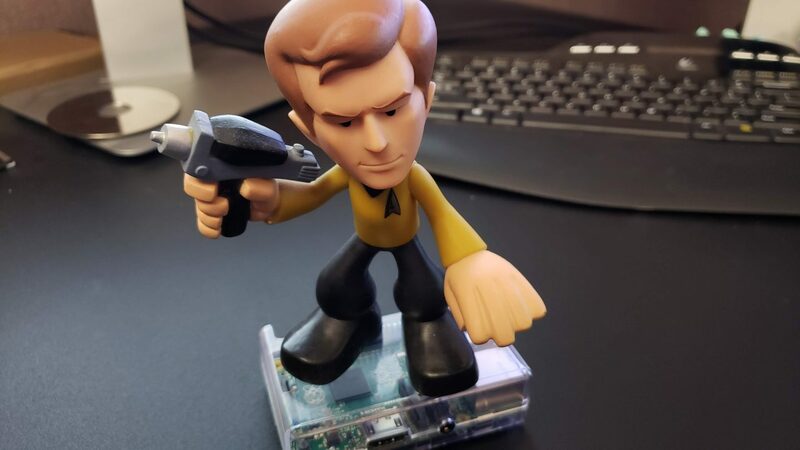 This case just makes it seem like your pi is ready for work, and action. Previous Previous post: The One Raspberry Pi Project Every Household needs!